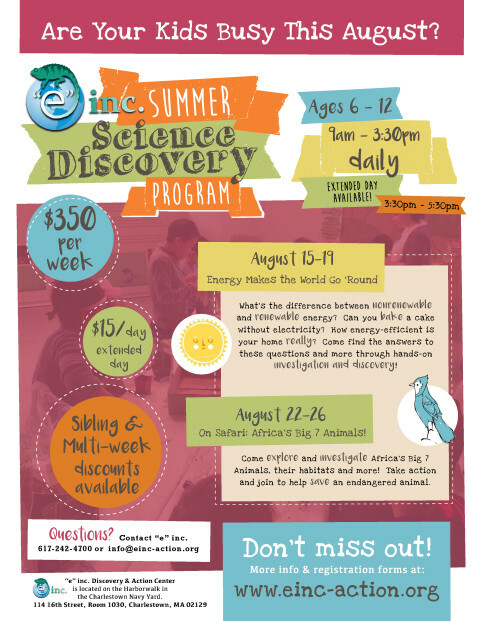 “e” inc.’s Summer Science Discovery Program is back with all new activities for kids ages 6-12. Want to become an engineer and discover how to harness power from the sun? Curious to know what’s the most dangerous animal in Africa (its not what you think!)? With a variety of activities – conducting science experiments, building models, observing live specimens, artistic expression, rowing on the Little Mystic, field trips, etc. – there’s something for everyone at “e” inc.! Kids will gain an appreciation for the natural world, as well as learn skills to become environmental stewards.